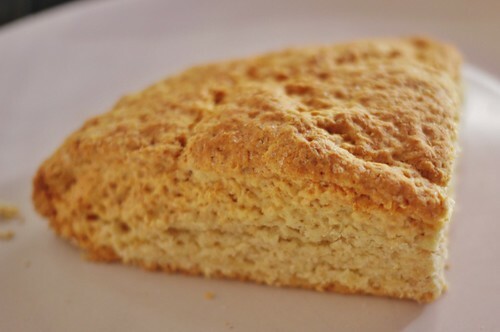 The Brodick bannock originally comes from the Isle of Arran and is very similar to the Fife bannock. It is sweeter and lighter though, and the brown flour and addition of an egg in the recipe gives a slightly richer and more complex flavour, while the oatmeal gives it a good texture. These bannocks are very scone-like, and their sweetness means they make a good teatime treat, served warm with butter and jam. They can also be served with savoury dishes, though, as an accompaniment to stovies, for example. This bannock is the one I make the most – it’s hard to go wrong with it! 1. Have a baking sheet ready for the dough and preheat the oven to 200C/400F. 2. In a large bowl, rub the flour, baking powder and butter together. 3. Mix in the oatmeal and sugar and make a well in the centre. 5. Sprinkle a little flour onto the baking sheet and turn the dough out onto it. Shape the dough into a flat round, about half an inch thick. 7. Bake in the oven for 15-20 mins and serve fresh and warm with butter and jam or honey. Since there’s no leftovers to make a bonnach fallaid with, don’t forget to break some off to leave as an offering. 1 Recipe adapted from here. 2 See Carmichael’s Carmina Gadelica, 1992, p590-591. Michael and the Trinity can be substituted for names you feel are more appropriate if you wish. 3 See Carmichael’s Carmina Gadelica, 1992, p590-591. Michael and the Trinity can be substituted for names you feel are more appropriate if you wish.